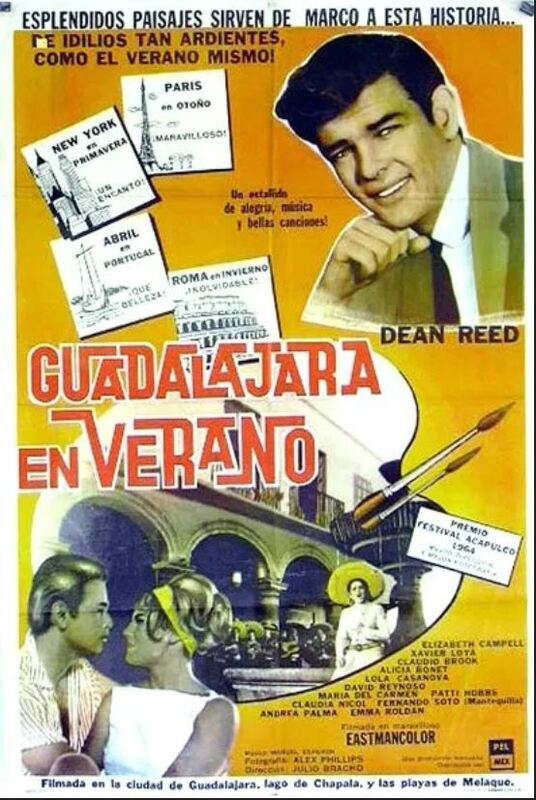 For a sense of what Guadalajara and Lake Chapala were like in the early 1960s, the movie Guadalajara en verano is a great starting point. To watch the 95-minute film, released in 1965, via Youtube, click the link. Guadalajara en verano is an enjoyable mix of a simple, cross-cultural romantic storyline in the city of roses and a documentary highlighting some of Jalisco’s tourist sights and infrastructure. Written by Adolfo Torres Portillo, and co-produced by José Luis Bueno and Xavier Torres Ladrón de Guevara, the movie was filmed in the summer of 1964 in Guadalajara, at Lake Chapala and at the Pacific coast beach town of Melaque. The plot revolves around a group of students who arrive in Guadalajara to attend summer school classes. This allowed the producer to open the movie with shots illustrating Guadalajara’s excellent links to the outside world via buses, trains and its international airport, and its varied accommodation offerings, from a casa de huespedes to the Hotel Fenix and Camino Real. In those days, the city streets were not clogged with traffic, the roses bloomed in profusion and the parks were well-maintained gardens..
Having foreign students visit Guadalajara also provides the excuse, if one were needed, to film the city’s newly-opened Hilton hotel and follow the students around as they explore the city’s markets, parks and buildings, with time spent admiring some of the many murals that grace its public buildings, including the Hospicio Cabañas (then an orphanage, now the Cabañas Cultural Institute) and the Government Palace. The movie’s director, Julio Bracho, later made a film about the New York experiences of Jalisco muralist José Clemente Orozco: En busca de un muro (1974). The part of Guadalajara en verano made at Lake Chapala includes footage of the highway, the Beer Garden in Chapala and a luxurious private residence. Needless to say, the movie does not miss the opportunity to showcase a girls’ choir, mariachi singers and musicians, and the Ballet Folklórico de Jalisco (performing the Jarabe Tapatío) along the way. The short Melaque section, near the end of the movie, served to underscore the tourist potential of the Jalisco coast and promote the then relatively unknown attractions of the Pacific coast of Jalisco, coincidentally at about the same time as Richard Burton and Elizabeth Taylor helped put Puerto Vallarta on the map. Actors in Guadalajara en verano include Elizabeth Campbell, Xavier Loyá, Alicia Bonet, Claudio Brook, Emma Roldán and Andrea Palma. The movie’s main male protagonist, Robert Douglas, was played by U.S. singer and actor Dean Reed who went on to enjoy a stellar career in Latin America and Eastern Europe, regions where the audiences appreciated his lyrics, which protested U.S. foreign policy, war and nuclear tests. It is a sobering thought that the movie was made at a time when the population of Guadalajara had barely reached one million (compared to around 5 million for the metropolitan area today). On the other hand, 1964 was the year when Walt Disney visited the city for the “De Pueblo a Pueblo” meeting, Bing Crosby promoted golf at Guadalajara Country Club, Tequila Sauza started sponsoring “Noches Tapatías” on national TV, and when the Chapala Society officially changed its name to become The Lake Chapala Society. Lake Chapala on the silver screen: El ametralladora (The Machine Gun) , 1943. 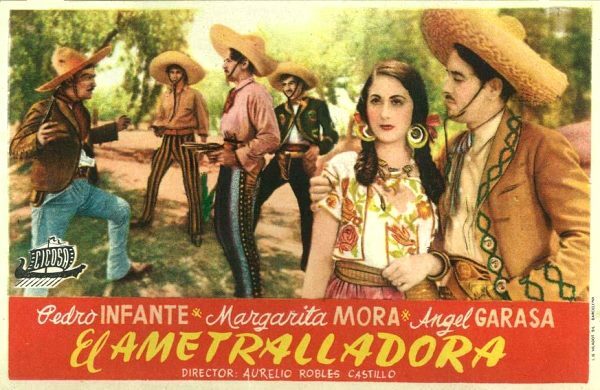 The full-length Mexican movie El ametralladora (“The Machine Gun”) was released in September 1943. The film, written and directed by Aurelio Robles Castillo, was shot at several locations in Jalisco, including Lake Chapala. 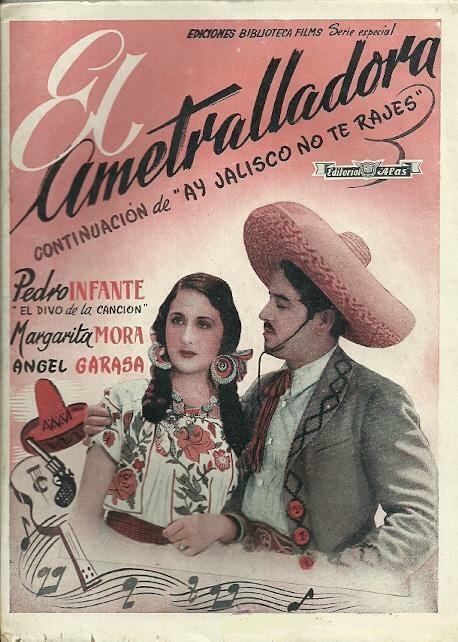 The all-star cast of El ametralladora included the legendary actor and singer Pedro Infante, Margarita Mora, Ángel Garasa and Víctor Manuel Mendoza. The music was provided by Mariachi Vargas and Las Tres Morenas. The 98-minute film, produced by Jalisco Films, S.A., was released in Mexico on 28 September 1943 and in Madrid, Spain on 18 August 1947. In addition to Chapala, parts of the film were shot in Atotonilco, Guadalajara and Tepatitlán. The cinematographer was American-born Jack Draper (1892-1962), who spent most of his career in Mexico and worked on an incredible number of movies between 1925 and 1962. One of the earliest films related to Lake Chapala is the silent movie La gran noticia. Most of the film was shot in studios in Mexico City but some parts were shot on location in the town of Chapala in the summer of 1921. The director (and co-screenplay writer) of La gran noticia was Carlos Noriega Hope, a Mexican journalist, author and director who was in charge of the print magazine El Universal Ilustrado from 1920 to 1934. La gran noticia is the story of an adventurous reporter who is given a month’s vacation in Chapala by his editor on condition that he investigate the crimes of a local gang. In Chapala, he meets and falls in love with a beautiful French woman. In his pursuit of her he confronts and kills a mysterious criminal. The screenplay was written by Noriega Hope and Marco Aurelio Galindo. Carlos Noriega Hope (1896-1034) studied law before becoming a journalist. One of his early assignments was to visit Hollywood and report on the nascent cinematographic industry there. He wrote several books as well as the screenplays for Santa (1932) and Una vida por otra (1934). Marco Aurelio Galindo (1902-1989) was a Monterrey-born writer, film critic and translator who won a Silver Ariel for “Best Adaptation” for his work on Los Fernández de Peralvillo (1954). His other screenplays included Se la llevó el Remington (1948), La edad de la tentación (1959) and El Zurdo (1965). He also directed numerous movies, including Corazón de niño (1939), El hombre de la máscara de hierro (1943) and Bodas de fuego (1951). He translated works by Eugene O’Neill and Joseph Conrad, and was head of publicity for Metro-Goldwyn-Mayer in 1934. American photographer William (“Bill”) J. Beckway (1881-1945) was the principal cinematographer for La gran noticia. He was the cinematographer for numerous films between 1915 and 1937, including Comrade John (1915), The Matrimonial Martyr (1916), 1917 Told at Twilight (1917), Betty Be Good (1917), The One-Way Trail (1920), Secrets of Chinatown (1935), Stampede (1936) and Woman Against the World (1937). Work on the movie La gran noticia was completed in 1922 and the film premiered in Mexico City on 15 January 1923. The American Cinematographer (Los Angeles), Vol. 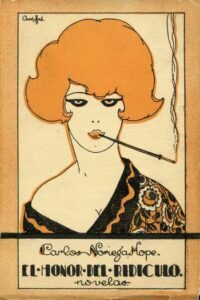 2, #20, 1 November 1921. Javier García-Galiano. 2016. “Noriega Hope: un habitante del mundo de las sombras.” El Universal. Confabulario (suplemento cultural), 1 October 2016. Guillermo Vaidovitz. 1989. “Reseña de la producción de cine en Jalisco durante la época muda”, 120-132 in E. E. Sánchez Ruiz (comp.) 1989. Medios de Difusión en Jalisco. Avances de Investigación. Guadalajara: Universidad de Guadalajara, Cuadernos del CEIC, Comunicación y Sociedad, No 4-5). We welcome comments, corrections or additional material related to any of the writers and artists featured in our series of mini-bios. Please use the comments feature at the bottom of individual posts, or email us. Shortly after retiring from Hollywood, Sherman (“Sherm”) Harris and his wife, Jane, moved to Ajijic to run the Posada Ajijic. Harris, who had previously managed a 450-room hotel in Disneyland, ran the Posada from 1963 to 1968. 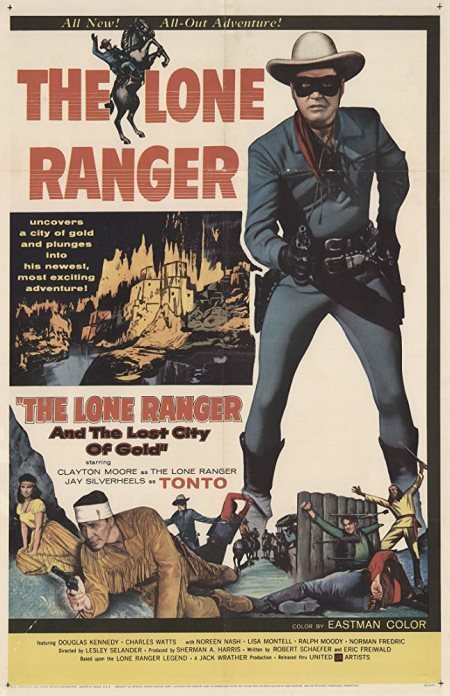 He was a film editor and TV producer best known for the Lone Ranger movies and TV shows, and for more than 70 episodes in the long-running Lassie TV series. Sherman Allison Harris was born in Minnesota on 8 Mar 1909. His parents were sufficiently well-do-do that they had a full-time live-in helper when their children were young. Still in his teens, Harris spent the summer of 1928 in Europe. By the time of the 1930 U.S. Census, Harris was living in Los Angeles, where he apparently first worked for the Bank of Italy (now Bank of America). On 9 April 1932 he married Ninette Crawford (1912-1978) and the following year he began working in movies as a film editor (cutter). By 1940, the Harris household – “studio worker” Sherman, his picture extra” wife, Ninette, and their 3-year-old son, Sherman – was established in Van Nuys, North Hollywood. As a film editor, Harris worked on It happened One Night (1934); Broadway Bill (1934); One Night of Love (1934) and Mr Smith Goes to Washington (1939). In the succeeding decades, he was production manager for several movies and TV shows including Cheers for Miss Bishop (1941) and then, after World War II, for Rendezvous (1946); Dangerous Millions (1946); and Guilty of Treason (1950). He was producer of hundreds of television programs in series such as Stars over Hollywood (1951); Hollywood Opening Night (1951-52); The Loretta Young Show (1953); The Lone Ranger (1956-57); and Lassie (1958-1960). It is unclear when he divorced Ninette, but on 1 December 1960 Harris married Jane E. Goza (1916-1968) in San Diego. After retiring from the movie industry and directing a 450-room hotel in Disneyland, Harris and his new wife moved to Mexico in 1963. Harris had replied to a classified ad in the Los Angeles Times for someone willing to invest $5,000 “in a growing business”. The growing business turned out to be the Posada Ajijic. Harris bought the business (not the property) from Vic Aldridge and spent several years building up the business, including improvements such as upscaling the restaurant and adding a swimming pool, bar and a new patio. Sherm Harris sold his interest in the Posada Ajijic to Sue and Booth Waterbury in 1966. Harris and his wife continued to live at their lakeshore home of Morelos #33 in Ajijic, but Jane died, unexpectedly, in a Guadalajara hospital in 1968. Within a couple of years, Sherm Harris remarried. His new bride was Adele Adams Harris. Sherman Harris died in Houston, Texas, on 20 August 1980 and donated his body to medical research. Guadalajara Reporter, 19 March 1964. Jack McDonald. 1970. “Sherm Harris. Posada Ajijic’s former owner was top Hollywood Producer.” Guadalajara Reporter, 7 March 1970, 15-16. Van Nuys, California, City Directory, 1939.